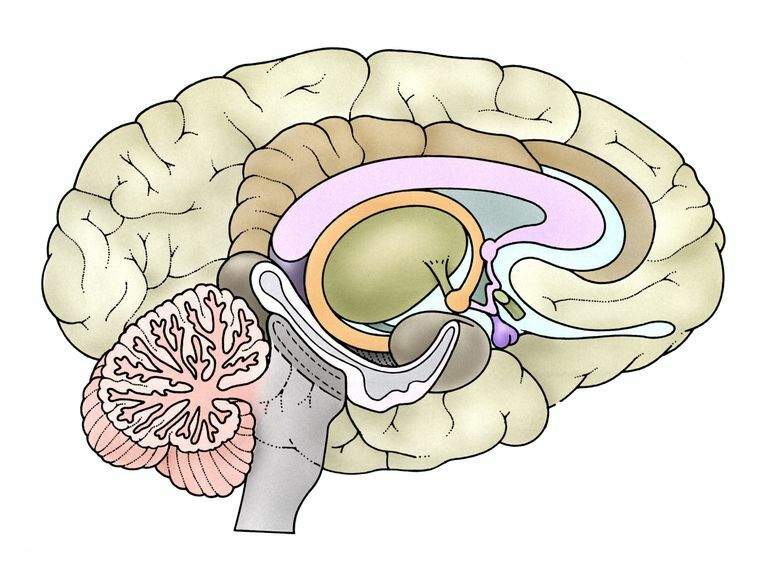 The hippocampus is an area of the brain just under the medial temporal lobes. It's similar in shape to a seahorse, and there is one on each side of the brain above the ears. The hippocampus helps us develop new memories. It is sometimes viewed as the gateway for memories as if the memories need to pass through the hippocampus to be able to be stored in the long-term memory bank. Some research has also shown that the hippocampus is important for not just forming new memories but also retrieving old memories. Interestingly, the hippocampus on the left side often has a greater function in memory and language than the one on the right side. Research has found that one of the first areas in the brain affected by Alzheimer's disease is the hippocampus. Scientists have correlated atrophy (shrinkage) of the hippocampal areas with the presence of Alzheimer's disease. Atrophy in this area of the brain helps explain why one of the early symptoms of Alzheimer's disease is often impairment of memory, especially the formation of new memories. Hippocampus atrophy has also been correlated with the presence of tau protein that builds up as Alzheimer's disease progresses. So, the size and volume of the hippocampus are clearly affected by Alzheimer's disease. But what about in mild cognitive impairment, a condition that sometimes, but not always, progresses to Alzheimer's disease? Studies have shown that atrophy of the hippocampus also correlates with mild cognitive impairment. In fact, the size of the hippocampus and the rate of its shrinkage have been shown to predict whether MCI progresses to Alzheimer's disease or not. A smaller hippocampal volume and a faster rate or shrinkage correlate with the development of dementia. Can Hippocampal Volume Differentiate Between Different Types of Dementia? Several research studies have measured the hippocampal volume and looked at how it relates to other types of dementia. One possibility was that physicians could use the extent of atrophy in the hippocampal area to clearly identify what type of dementia was present. For example, if Alzheimer's disease was the only type of dementia that significantly affected the size of the hippocampus, this could be used to positively diagnose Alzheimer's. However, multiple studies have shown that this measure is often not helpful in distinguishing most types of dementia. One study published in the journal Neurodegenerative Diseases noted that a decreased size of the hippocampus occurred in vascular dementia. A second study found that decreased hippocampal size was also correlated with frontotemporal dementia. Scientists did discover a significant difference, however, when comparing Lewy body dementia with Alzheimer's disease. Lewy body dementia shows far less atrophy of the hippocampal areas in the brain, which also coincides with less significant effects on memory, especially in the earlier stages of Lewy body dementia. Can You Prevent the Hippocampus From Shrinking? The plasticity (a term for the brain's ability to grow and change over time) of the hippocampus has been demonstrated repeatedly in research. Research has found that, although the hippocampus tends to atrophy as we age, both physical exercise and cognitive stimulation (mental exercise) can slow that shrinkage and, at times, even reverse it. Nature Reviews Neurology 8, 189-202 (April 2012). Modifiable factors that alter the size of the hippocampus with aging. What Are the 4 A's of Alzheimer's Disease? Can Yoga Improve Memory and Help Prevent Alzheimer's Disease? Who Was Alois Alzheimer and How Was Alzheimer's Disease Discovered? Who's Likely to Get Alzheimer's Disease? When Should You Worry About Word-Finding Difficulty and Alzheimer's? What Are the Late Stage Symptoms of Alzheimer's Disease? Are Multiple Sclerosis and Alzheimer’s Disease Related? Can Melatonin Help My Loved One with Alzheimer's Disease?